The program will offer up to 12.5 hours of CLE, including ethics and professionalism hours, on a variety of timely and relevant topics to help your practice. After classes conclude each day, we have a full schedule of social events, including a Welcome Reception, the President's Reception, the Young Lawyers' Reception, a Golf Tournament, a Crawfish Boil, and more! Only registered CLE attendees and their registered spouses/guests may attend the President's Reception. For room reservations, book directly through Beau Rivage online HERE or by phone at (888) 567-6667. The JBA room rate this year is $145.00 a night, plus a $10.00 daily resort fee and tax. 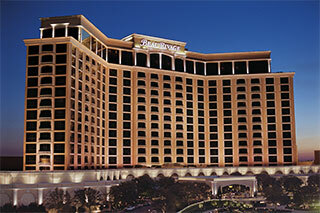 Reservations must be made directly through the Beau Rivage. To receive the JBA room rate, you must identify your affiliation with the JBA when you make your reservation. The room block expires March 8, 2019. Make checks payable to Jefferson Bar Association. The Golf Tournament will be held on Friday, April 5, 2019 at Fallen Oak Golf Club. Golf begins with a shotgun start at 1:30 p.m. All players will play their own ball. You may enter as a foursome or enter alone to be placed with a foursome. A box lunch will be provided at the course. Refreshments including beer, water, sodas, & snacks will be provided during play. The entry fee is $125.00 for participants in the CLE and $175.00 for those JBA Members not registered for the CLE and participating in the Golf Tournament only. The entry fee includes green fees, carts, box lunch, refreshments, and prizes. The field is limited to 24 players and entry is on a first come basis. No exceptions. Entries must be received no later than March 28, 2018. If you need additional information, contact the Golf Chairman Jason Anders at (504) 606-4530.